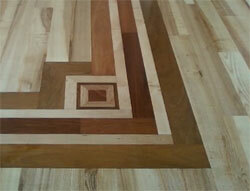 We specialize in beautiful custom hardwood borders and inlays. Check out our portfolio to view some of our beautiful custom work. We install and refinish wood floors of all species. We will stain your hardwood floors to your exact specifications.